In childhood we heard her. 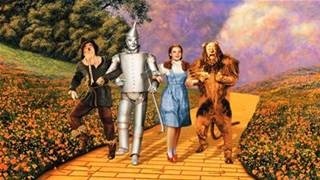 My grandmother was the first one who introduced me to The Wizard of Oz and she would always sing the song all day long after we’d watched it together. Funny thing was that my grandmother didn’t understand a word of English so she would always have the movie on mute but with Swedish subtitles. However, as soon as there was some singing involved she would unmute and sing, not in comprehensible English but in her own magical way. I’m going to show her this poem next time I see her and translate it for her. I’m sure she’ll love it just as much as I do! One of my the favorites, Richard!! I was The Wicked Witch of the West in a school play…so much fun! But I really wanted to be Dorothy 😦 Who knows…maybe that was the start of my descent…..
We just watched this movie a few nights ago! Thank you for your wonderful poem! I am afraid to say, when I hear this song, I cry. I hear such a beautiful voice and an amazing talent which lived a hard life. Such emotion in her voice. And you yours. Perhaps we will see a Unicorn! Wow!!! A lovely song. It makes me emotional. I think everyone. It’s magical. Perfect. Yes it is. I’d love to travel over the rainbow. Love this song and movie and your poem is perfect! It tells it well–we were and when we hear the song again or see the movie again, we were again. 🙂 Your poem made me smile.